A significant proportion of most tourist visits to Bhutan will be spent on the road. The only options for getting places are driving or trekking. There are no trains, domestic flights, ferries... 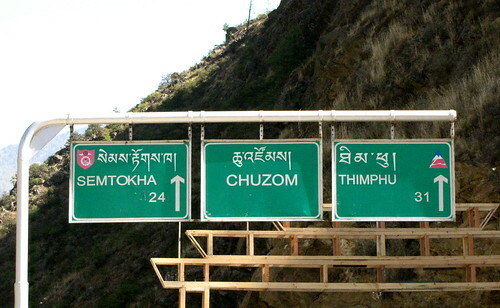 In fact, according to the Tourism Council of Bhutan, the construction of roads began only in the 1960s. The highway between Paro and Thimphu, the capital, was recently widened and improved so the 65 km journey is smooth and quick. Otherwise, much of the main Lateral Road and many of the branch roads are narrow, high elevation and very twisty because they are cut into mountain sides. There's a statistic of '6 bends per kilometre of highway' floating around. The roads are comfortably wide enough for one army truck, but too constricted for two vehicles to pass each other at speed. Therefore, anytime vehicles need to pass, the drivers slow down to hug the road shoulder. There are many blind corners in the mountainous regions, so the horn is constantly being honked. Typically, one edge of the road grazes a sheer rock face while the opposite side drops off to a cliff. Other driving obstacles include clouds, cows and yaks, slow-moving Tata trucks and road crews either widening the highway or removing debris from the most recent landslide. Despite all of this, I was never concerned about road safety since drivers in Bhutan seem to be very patient and sensible. No racing or road rage here. Also, with so few roads in the country, a tour driver will have skirted the same mountain turns hundreds of times before. Just a splash of blessed water from a prayer wheel and he's revived, ready to continue the journey! Is there much in the way of emigration from Bhutan? From the looks of the landscape, the Bhutanese would be right at home in the Canadian Rockies. Great post, almost like I was right there! Hi Greg! Actually, the Rockies are pretty tame compared to Bhutan's topography.